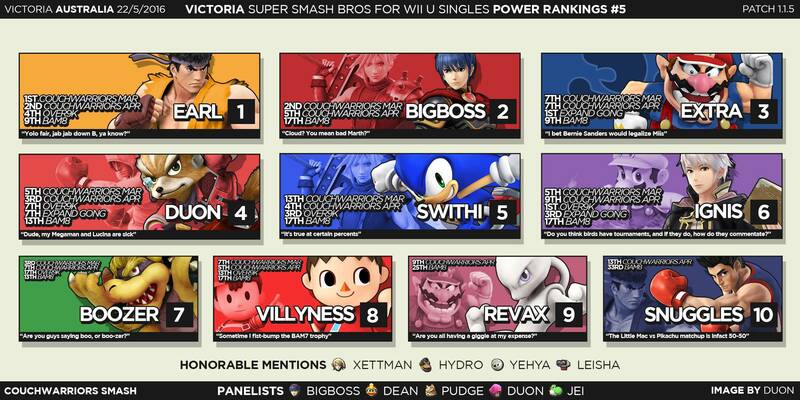 This thread is to inform users of upcoming tournaments in Victoria and to discuss Victorian Smash in general. If you add my event, I will let you have friendlies with me once. Maybe twice if I'm in a good mood. Someone get me and Boozer a cake, it'll be our birthdays next monthly in March. Who's gonna go to expand gong in april? I'm going to start posting important news in this thread because at least 20 people came to see me at the ranbat and said they weren't apart of the FB group. Also dean how do put the latest CW ranbat in to QLD smash? does QLD smash take gg yet? No it takes me about 1-2 hours to convert Smashgg into a TIO file for the website. I'm still in Melbourne for another week and a bit. Are there any particular days/places for friendlies? There's a meet / tournament at EB Games Swanston St on Friday. Actual thing starts at 4 people usually start showing up at 3.
Who wanna team at SXC? Well that took forever but CW results are up. With no CW until Jan 28 and no S@S until the new year, we still have tournaments every second Tuesday with EBS (next one 13th December) and Guf Geelong will continue to host tournaments every Wednesday evening. monthly results are finally up. My laptop's broken so I'll be unable to upload any results from smash.gg tournaments for the time being. Hey there plebs. If you haven't already connected your smash.gg account to your Ausmash account can you maybe do this, it helps with streamlining the importing of results. How do you link the accounts? I'm... not sure. I think you need to connect Twitter to both smash.gg and Ausmash and it links from that? Figured out that I'm pretty sure I need a claim a competitive account first and then I can link them.